On Thursday, Feb.7, the Asian Student Association and Pan-Asian Student Services will sponsor a Lunar New Year celebration and panel discussion on campus. The Lunar New Year is an Asian celebration which starts with the first new moon of the lunisolar year and continues until the first full moon (usually about 14 days). For many Asian cultures, the Lunar New Year is a celebration of change, a moment to renew oneself, and a time to welcome in the coming year with family and friends. During Augsburg’s Lunar New Year celebration, speakers will explore the varied Lunar New Year traditions of Asian cultures, and a panel will be formed to answer student questions. 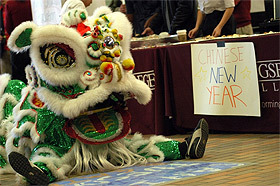 The celebration will begin at 4:30 p.m. in the main lobby of the Christensen Center with a lion dance performance. Afterwards, from 5 – 6 p.m., the panel discussion, “Ethnic New Year Celebrations and Cultural Traditions,” will be held in the Marshall Room of the Christensen Center. After the discussion, a Lunar New Year-themed dinner will be served in the cafeteria. The events are free to all Augsburg students, and all are strongly encouraged to enjoy the great dialogue and food. Please RSVP to thao@augsburg.edu or attend the panel discussion if you would like the free dinner.